I wonder how many copies of the sun are sold in that part of London? They must see through this. 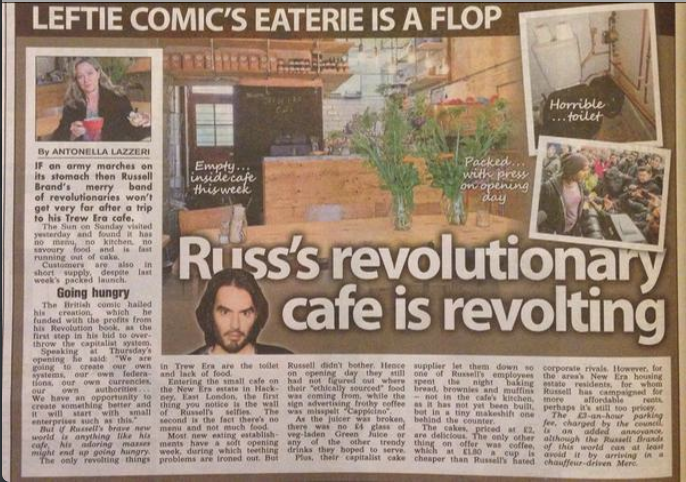 The more the sun craps in its own nest the more the circulation figures will drop..
Russell Brand won't be unhappy about this hatchet job, it comes firmly under the PT Barnum "don't care what they say about me, as long as they spell my name right" category. Anyone with half a brain can see the agenda, which leaves perhaps 15% of Sun readers who may now consider his new caff for their morning cuppa. And I'm no fan of Brand myself, but I'm sure he doesn't care about that either.